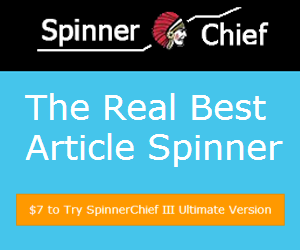 The SpinnerChief III is a spinning tool which can generate content, just like it can rewrite articles to a very high level of human readability and uniqueness. It uses a natural language analysis and artificial intelligence techniques to understand your entire articles. Similar to how search engines are looking at articles. 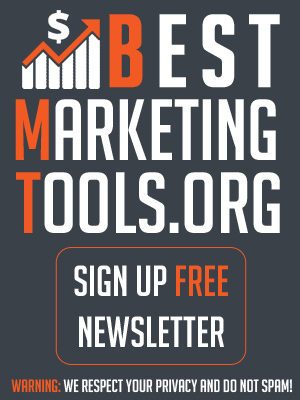 According to their website are more than 100,000 people using the spinning tool to create/spin content. The SpinnerChief can spin the sentences/paragraphs as well as it can generate nested spun articles completely automatically. Depending on the edition you choose you will have different features included. Available are 3 different editions. There is a free, an elite and an ultimate edition. The SpinnerChief’s Free Version comes with lots of features and has everything you need to dive deeper into the world of spinning. You might not get access to the Cloud Thesaurus and its millions of synonyms created by real users. But you can still save the synonyms you created locally and also import synonyms from text files (supported are multiple formats). Save/import synonyms locally – Create your own Thesaurus. Save and import them. Batch spin articles – Meaning if you have a lot of articles prepared you can spin them all automatically. Categories and niches – Managing favorite synonyms is easy when you can put them in categories and niches. Quick Preview – The quick preview let’s you know how your spun content looks. Protecting keywords – An important feature to let the software know, which keywords not to change. Uniqueness indicator – The uniqueness indicator showing you a percentage of how unique the articles are. Similarity check – You can also compare multiple articles to each other to see there similarity. 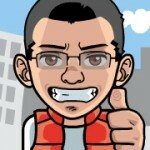 Free updates – Seems like SpinnerChief’s Free Version is here to stay. 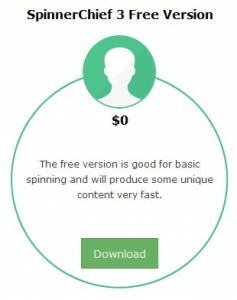 The SpinnerChief free version covers everything you need for basic spinning and produces unique content very fast. If you are new to spinning or if you’re only spinning basic content from time to time, this might be the right spinner for you. So the free version of the SpinnerChief is not only a good spinner for beginners but also for those who only need a manual spinning tool occasionally. Cloud Thesaurus – Access to over one million (by real users created) synonyms. Article Scaper – Scrape articles related to your keywords from selected sources and import them into directly into SpinnerChief. Image & Video Scraper – Scrape for images and videos related to your keywords and you can easily insert these videos into your article with one click. Submit article(s) – Auto-Post Articles to Blogs and Directories. Including scheduling them. Custom/Cloud Rules – This feature lets you select better synonyms by analyzing the related words in the sentence. Custom/Cloud Negs – Another innovative feature invented by SpinnerChief to remove unwanted synonyms. The cloud negs database is based on all SpinnerChief users’ selections and input as well. 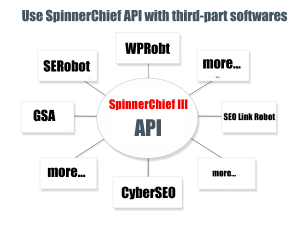 API access – Free access to their SpinnerChief III Elite API to use their service with other Apps. And more – batch adding hyperlinks, HTML spinning and much more. 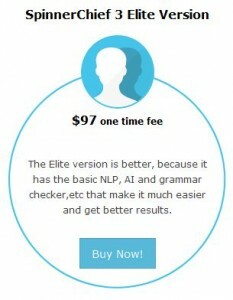 The SpinnerChief 3 Elite Version is available at a one time fee and comes with a grammer checker, artificial intelligence, and free access to their Elite-API, and more (see above). This spin tool is also for the occasional spinner that would would like to do more than just manual spinning. You will also likes like to benifit from the grammer checker, basic NLP and AI that indeed make the life of a spinner easier. For a couple dollars more you get the ultimate version which indeed is packed with a lot more features. The SpinnerChief III Ultimate Edition includes all of the Free Edition & Elite Edition features, although instead of the Elite API you have access to the much better SpinnerChief III Ultimate API to use with all kinds of content creation tools. Ultimate API-Access – Free access to their SpinnerChief III Ultimate API to use their service with other Apps. Super Spin – The Ultimate Edition also includes the Super Spin feature which rewrites articles to a pretty high level human readability and uniqueness using natural language analysis and AI techniques. Auto-Spin – The function to fully automatically spin sentence and paragraphs is also only available in the Ultimate Edition. 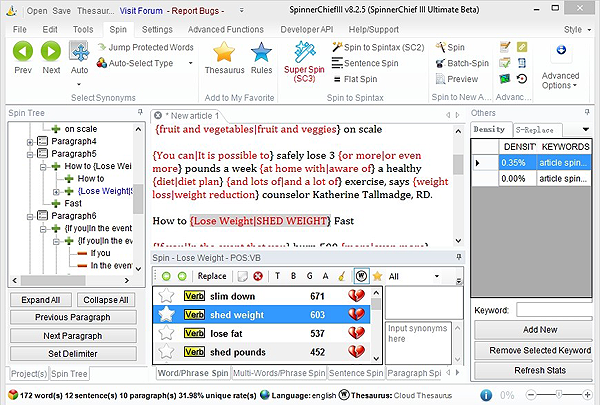 Spin Tree – The SpinnerChief III Ultimate also features the Spin Tree function, which makes manual paragraph and sentence spinning much easier. Looks more complicated than it is… check the video below to see it in action. After the 3 days you can choose between a lifetime licence for$197 and a 1-year licence for $67 per year. 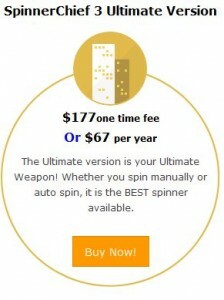 OR get SpinnerChief III Ultimate Version with a Lifetime licence right NOW for only $177! Check out the following SpinnerChief video to get a better idea of what to expect. Great is SpinnerChiefs concept of letting users add their created Thesaurus to the SpinnerChiefs Thesaurus Exchange System to sell or give away for free. Summary : Great manual spinning tool. Good Auto-Spinning Tool.